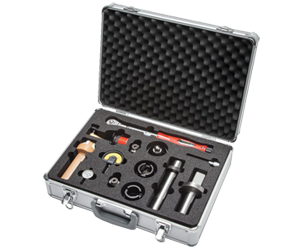 The geometry set provides you with all tools, measuring instruments and special-purpose tools for checking the geometry after a collision or a tool breakage at the machine. The geometry set is also at hand at all times for preventive maintenance. The geometry set is for the preventive inspection of machines and their quality requirements. To be able to ensure that the high quality requirements relating to production and availability are met, the maintenance of machine tools is essential. One of the most important checks applies to the geometry of the machine. Geometry errors can result in unacceptably high forces being applied to the drive elements, which can lead to the premature failure of complex subassemblies, such as tool drive, slide guides, feed drives or ball screw. Therefore, the regular and preventive inspection and recovery of the tool carrier geometry but also of the entire machine geometry is one of the most important prerequisites for production without any loss in quality and for protection against consequential damage. We have compiled the geometry set for this inspection, and also for the prescribed maintenance of the tool carrier and the machine’s geometry. The geometry set can either be purchased or acquired as a service for the alignment of the machine’s geometry.